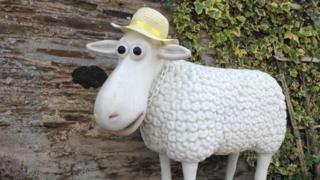 Image caption The life-size statue, know locally as Shaun the Sheep, has been described as a "village icon"
A life-size statue that looks like Shaun the Sheep has been stolen from a village in Devon. Police said it was taken from its home in Chillington on Monday 27 or Tuesday 28 August. They think that thieves used a pair of bolt cutters to break the chain that secured it to the wall of Cutlands Barn. Owner Claudette Uff said she was devastated by the theft of the statue, which she said was a "village icon". "As you drive through Chillington, you may have seen Shaun the Sheep looking out onto the road, and you may have had a little smile," Kingsbridge Police said. "He's not worth a great deal of money, but to his owners and the residents of Chillington, he's priceless." They added: "If anybody has any information as to where Shaun may be and who took him then please get in touch."